Halal meat has returned to headlines in the past weeks – but what are the facts? Halal slaughter of animals was conceived on the historical principle that it was one of the more humane methods available. Yet now the RSPCA says that, when compared to methods that involve stunning the animal beforehand, it can cause unnecessary suffering, pain and distress. Q What does halal mean? Halal is the Arabic word for “lawful” or “permitted”. It is a broad term covering what is allowed in the context of Islamic law, but is often used in conjunction with the issue of how meat is dealt with. The opposite of halal is haram, meaning “forbidden”. Q What does halal slaughter involve? Traditional halal meat is killed by hand and must be blessed by the slaughterman. Islam has strict laws on the proper method of slaughtering an animal. One, called dhabihah, requires a swift, deep incision with a sharp knife on the neck that cuts the jugular vein. Under both the Muslim method of slaughter, known as Zabiha, and the Jewish practice, known as Shechita, a surgically sharp instrument is used to cut straight through an animal’s throat, windpipe and the blood vessels in its neck killing it instantly. Under Islamic rules animals can be stunned before the procedure. The vast majority of halal meat comes from animals that were pre-stunned. Shechita prohibits pre-stunning, with Jewish leaders saying that the act of cutting the animal’s neck renders it “insensible to pain” and has the same effect as mechanical stunning. Q Are animals conscious when they are killed for halal slaughter? For the majority, no. Between 84 and 90 per cent of animals killed for halal meat in the UK are processed by one of the large number of halal slaughterhouses which do use electric stunning beforehand. This does, however, leave a significant minority of animals which are killed without being stunned first, at one of a reported 12 slaughterhouses in the UK which still perform the more traditional practice, endorsed by Islamic scholars, of keeping the animal conscious when its throat is cut. Q Is religious slaughter cruel to animals? In March John Blackwell, head of the British Veterinary Association (BVA) insisted animals should be stunned before slaughter, saying that otherwise sheep could remain conscious for up to seven seconds after having their throat cut, while for cattle it was two minutes. Jewish groups, however, defend their method of killing animals without first stunning them, saying using a sharp knife to cut through the neck is a “humane act designed to bring about the animals’ end very quickly”. Q Do methods of religious slaughter comply with government rules? Yes. Although legislation in Britain requires the pre-stunning of animals before slaughter in normal circumstances, there has always been an exemption for the Jewish and Muslim methods of slaughter. The exemption dates back to the Slaughter of Animals (Scotland) Act 1928 and the Slaughter of Animals Act 1933. Q What are the current rules on the labelling of kosher and halal meat? There is no legal requirement for products to be labelled as halal or kosher. Q Do halal slaughterhouses in the UK face different regulations to non-halal ones? No, with the single exception of whether or not stunning is used. For halal slaughter that includes pre-stunning there is no practical difference in the way the animal is treated. While European law requires animals to be stunned before slaughter, the UK has an exemption in place for halal and kosher killing. In exchange there are actually more regulations in place governing the handling of animals that will not be stunned when slaughtered. Q Does halal slaughter without pre-stunning hurt animals more than other forms of slaughter? Yes, if British vets, the RSPCA and the Farm Animal Welfare Council (FAWC) are to be believed. The British Veterinary Association (BVA) says it believes “all animals should be effectively stunned before slaughter to improve the welfare of these animals”, while the RSPCA says it causes “unnecessary suffering”. A report from the FAWC said chicken and turkeys were likely to be conscious for up to 20 seconds after a transverse incision is made across their neck.“Such a large cut will inevitably trigger sensory input to pain centres in the brain,” the council said. Q What have governments done about the issue of halal slaughter without pre-stunning? European regulations require animals to be stunned before they are slaughtered, but grants exemptions on religious grounds. Earlier this year the Danish government decided to remove this exemption and said that “animal rights come before religion”. It joined Switzerland, Sweden, Norway and Iceland in banning the religious slaughter. 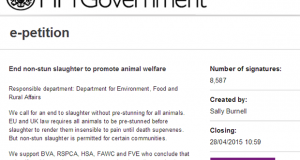 Last year politicians in Britain said they would not be outlawing halal slaughter without pre-stunning despite pressure from activists including the RSPCA, which has in the last week brought a new e-petition for them to do so. 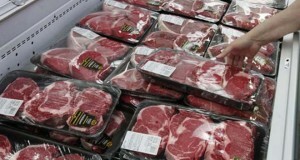 Q How is halal meat labelled? Currently, meat in the UK that is labelled as halal could be from pre-stunned slaughter or not pre-stunned slaughter – it is very difficult to guarantee either way. That is why campaigners are working to get clearer rules around labelling in place, and the industry body Eblex is currently consulting on introducing an assurance scheme to introduce “a level of transparency that it has been suggested is currently missing”. The European Parliament has approved a law change which would see compulsory labelling for all meat killed through halal slaughter without pre-stunning – but it could be years before this is implemented. Q What moves are underway to change the rules? The European Union is carrying out a study examining the feasibility of introducing labelling on meat to specify how the animal was killed. The British Government says it wants consumers to have “information about the food they are buying to make their own choice” and will consider the results of the study when it is published later this year. 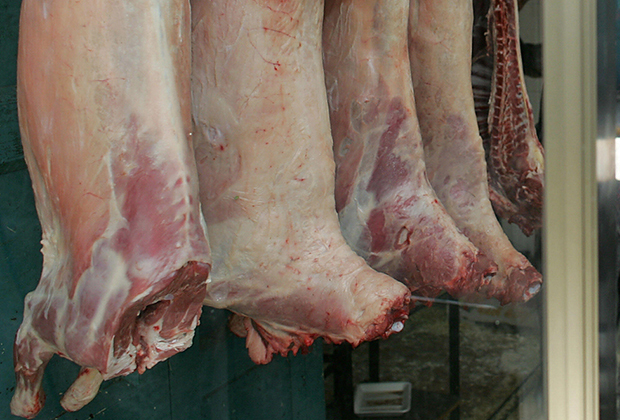 The BVA says Kosher and Halal meat that is not pre-stunned should be clearly labelled as such. Jewish and Muslim groups say they would support new labelling but only if it is “comprehensive” and covers methods of slaughter in each case, rather than just specifying if something has been religiously slaughtered. Q How much is the halal meat industry worth? The halal meat market in the UK is estimated to be worth around £2.6 billion a year. Eblex chairman John Cross described it as a “very important sector”, and said that assurances about the methods of slaughter were “vital for its future success”. Next: UK: Which restaurant chains have gone halal – and why?